Sergeant Matt Biddinger is excited to be the first officer assigned to one of the Ponca City Police Department’s new 2019 Dodge Chargers. This will be one of five new Dodge Chargers being deployed as patrol vehicles. “We have a total of 40 marked vehicles in our patrol fleet and drive approximately 450,000 miles each year” says Patrol Captain Randy Tyner. Each year the Police Department evaluates its fleet of vehicles and replaces those vehicles that have high mileage and/or high repair costs. The City’s goal is to provide Patrol Officers safe and properly equipped patrol vehicles, Tyner said. Officers living within the city limits of Ponca City are permitted to take their patrol vehicles home, which aids in officer response time during emergencies as well as long term wear and tear on the vehicles. The new Dodge Chargers also have been marked with updated striping that was implemented last year. The new design utilizes the same blue and gray colors as the Police Officer uniforms. 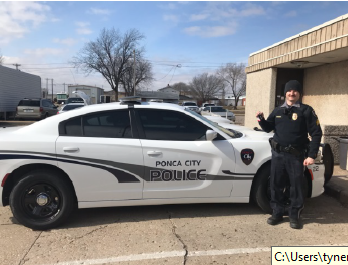 There is a City of Ponca City Police Department patch on the passenger side of the car and a Ponca City Public School Wildcat logo on the driver’s side. Patrol Officers can spend up to 10 to 12 hours each day in their assigned patrol car. “I am very excited to get assigned one of the new Dodge Chargers! Thanks to the City and the citizens of Ponca City for providing us with these quality patrol vehicles,” Biddinger said.